Good Morning. I am happy to be here. Really happy to be here. Given what's been going on in this town, I'm shocked any of us are here. And by the way, that's about how quickly we are going to have to get out of Afghanistan [motioning to stage], when they just took all that stuff off [the stage]. You know, it's good news. The government has reopened, all of you are here: Chief of Staff; Chief of the National Guard Bureau; Vice Chief of Staff; Sergeant Major of the Army; their spouses; civilian, as well as military leadership, to, again, take part in this wonderful celebration. I have to tell you, though, it's becoming a habit. A really bad habit, it seems, as if every year just before this keynote speech, something bad happens to me, personally. Last year, you may remember, I crashed my bike, I fractured my pelvis and gave the keynote from a wheelchair. Very FDR-like [laughter]. And this year, of course, the government shut down. Now, one of those two events gave me an extreme pain in my backside. The other, well, that was a broken pelvis [laughter]. But this year, I'm back, we're all back, so I guess the pain's on you. You've got to sit there and listen for a while, and I thank you for your patience. And let me just say, I'm not just back. I'm not sure what the record is, but this is my fifth keynote address; So Gordon, what do you say? If I make it one more year, a set of steak knives? Keychain? Something? Anything? [laughter]. Well, whatever the door prize, I'm just thrilled to be here. 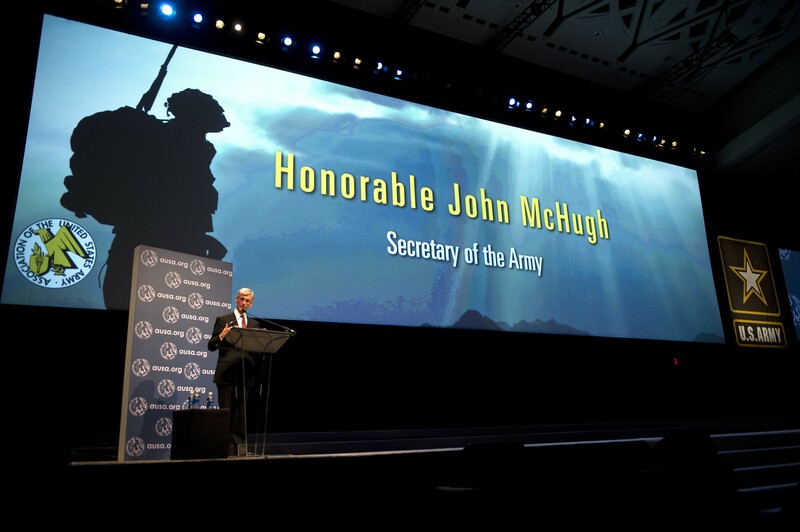 And it's important for me to state up front that this annual event is extremely valuable -- valuable to the Army as a whole, valuable to our Soldiers and civilians alike. And it really gives us a very unique opportunity to listen, to teach and learn, to work with people not just from within our own ranks, but across the services, with members of Congress and their staffs, other government agencies, academia, and of course, industry. And it's become a vital component of our development of both the civilian as well as the military, and current as well as future leaders. Now, there are a number of topics that I should touch upon today, but it's really impossible to begin without discussing the government shutdown, sequestration, the Budget Control Act; in short, the general state of the Army's fiscal house. And, as I've spoken about it in other years, in this very room, the Army -- and in fact, the entire Department of Defense -- knew full well that at some point, as then-Secretary Gates stated that the gusher was going to be turned off. We knew that our budget fortunes, just as they had done in every post-conflict period in our Nation's history, were likely to be reversed. But at that same time, we also had -- or we thought we had -- the opportunity, the time, to get it right. Unfortunately, on that last point, it turns out we were wrong. Now, in some ways, I tell you, the way we have managed what most would agree is an unmanageable situation, has really caused us, in part, to become victims of our own success. How did we get to that position? Well, you may recall, it was also Secretary Gates who challenged us -- well, he directed us, really -- to find and to cut $100 billion in spending over five years and then to use those efficiencies -- to use those cuts -- to reinvest in other, higher priority programs. And we did that. All of us did it -- the Army, the Navy, the Air Force, the Marines and, in fact, the entire Department of Defense. We set ourselves on a new course, one of more efficient operations, one of wiser investments. And we continued on that path of responsible and prudent reductions under Secretary Panetta, establishing for ourselves a glide-path that, if properly executed, would better ensure that we would not jeopardize current operations or, equally important, longer term readiness. And, of course, then something happened. Something happened called Sequestration. Something that Secretary Panetta observed "was so bad, no one in their right mind would let it happen." Well, apparently the right minds were out of town that day. It did happen. So there we found ourselves, required to make a year's worth of cuts in just six-months. And now, under Secretary Hagel's leadership, we've continued those previous efforts. We are making every possible adjustment in these random, across-the-board reductions; adjustments that have helped us better prioritize our most pressing needs. But -- I want to be very frank here -- for all of our efforts, for all of the hard work that everyone has put forward, the current and the ongoing fiscal realities have extracted a great cost. Not just in financial terms, but cost in real world programs and real world preparedness and real world manpower. And, perhaps most sadly all, real world morale. Think about it: Civilian workers lost 20 percent of their pay for six weeks, the very same workers who at that time had had no pay adjustments for three years, even though their bills continued to climb. These same dedicated workers have endured additional burdens through hiring freezes, through RIFs [reductions in force], through hiring lags. Their reward? More furloughs, all through no fault of their own and no failure on their part. But we're fortunate. In fact, we're blessed that their commitment to the Army and service to our nation has endured. We are blessed that, like those who wear the uniform, they have stuck with us and we owe them a tremendous debt of gratitude for that incredible loyalty [applause]. I wish I could promise them, I wish I could promise all of you, that better days lie ahead. Sadly, truthfully, I just can't. The indiscriminate nature of sequestration has already forced significant declines in readiness, and I know you've heard about it. I've heard from commanders who tell me that Humvees and Bradleys and tanks are sitting idle because of a lack of funds for driving, and training, and fires. Soldiers aren't getting properly qualified on their M4s unless they are preparing to deploy. Soldiers who don't get to shoot? Don't get to train? It really does bring back those pictures of World War I with recruits working out with broomhandles and sticks because they didn't have the real weapons to train with. And there's more. Just weeks ago, the G4, Lieutenant General Ray Mason, warned Congress of the growing inventory of equipment in need of repair from the ravages of war in Afghanistan: 800 vehicles, 2,000 weapons, 32 helicopters, some 10,000 pieces of communication gear, unrepaired and unavailable. Sequestration cost the Army $1.7 billion for reset just in fiscal year 2013. So what did we do? Well, we pushed most of those projects into this year, fiscal year 2014. And now, here we are, nearly a month into that fiscal year 14, and still, lacking sufficient funds and people to carry out fully this critical work. In short, we were forced to rob Peter to pay Paul; and then Paul got furloughed. Let me put it very, very simply. This is no way to manage the greatest military the world has ever known; and it sure is no way to manage the greatest country on the face of this earth [applause]. From here, our way forward is as difficult as it is uncertain and complex. In response, we are pursuing a bifurcated planning process. We are developing two POMs, two Program Objective Memorandums, the five year budget projections we prepare every year to chart our way forward. One of those POMs is based on the President's budget, the other, on continued sequestration, which remains the law of the land at this time. Similarly, we are devising two separate and significantly different budget plans for fiscal year 15. While we continue to hope for relief, prudence requires that we plan for reality. And here is another dose of reality. The last time that the Army had a budget in place at the start of the fiscal year, you couldn't have read about it on your iPad. Why not? The iPad wouldn't be released for another three years. Don't get me wrong. I -- all of us -- deeply appreciate what this Congress does for our Army. And I'm glad, like I know all of you are, that the government has reopened. But for 25 of the 49 months I've been Secretary of the Army -- more than half the time I've been here -- the Army has been funded not by set budgets, but by Continuing Resolutions. In fact, there hasn't been a full year's appropriation, adopted on time for us since 2007. And Continuing Resolutions, while far better than the alternatives of shut downs and no funding, are simply not a substitute for actual appropriations. They're designed to be stopgap measures; all they do is allow the government to keep functioning, or perhaps dis-functioning, as it were. It's important to understand that under a CR, for example, we can't move money around where it's actually needed, or do new starts in contracts. Budget dollars are largely misaligned placed against needs and priorities of previous years, leaving unfunded the priorities and needs of this year. The end result of all this is, at a minimum, things cost us more and they take longer to get. All of this budget uncertainty has forced us to be more creative and innovative in planning for the future. And, as many of you may know, the Chief and I have established internal focus groups to develop and propose innovative approaches and solutions and efficiencies; seven different groups focused on issues ranging from headquarters organization and readiness to acquisition and installation services. Regardless of how large or how small the Army and its budget become, I promise you -- we promise you -- we will do everything we possibly can to maintain balance, to ensure an adequate and an appropriate mix of manpower, training and equipment. Through it all, we will remain globally responsive, we will remain regionally engaged, we will provide combatant commanders with versatile and well-trained forces both for on-going and contingency operations. And we will do that even while making modifications to structure, to organization, and processes. We happen to believe that a smaller, but well-equipped and highly trained Army is better able to meet contingencies than a large force without sufficient training, without modern equipment, or without the people to use it. We will constantly endeavor to chart the wisest path; but I want to tell you, in this unreasonably constrained fiscal environment, even the wise path will be treacherous. I'm reminded, as I am so often when I'm here at AUSA, of a story about George Marshall, and I suspect many of you know it. As a brigadier general, Marshall headed up the war plans division, here in Washington, D.C., in the days leading up to United States' involvement in World War II. At a meeting of his senior military advisers, President Franklin Roosevelt proposed building 10,000 new aircraft to aid the possible upcoming war fight in Europe. Everyone, every single one, of FDR's military advisers supported that plan. All, that is, except one. All, that is, except Marshall. His reason? It was simple, really. Yes, they would have planes, but no pilots to fly them. Decisions, whether they be about manpower or equipment, must not be made in a vacuum. Training, end strength, modernization -- they are all equally critical, and must never be considered independent of one another. And because of that, we will, in all we do, be ever mindful of Marshall's wise perspective. So that is our challenge. Actually, that's just one of our challenges. Nowhere will we be more tested than in the level of support we will be able to provide to our Soldiers and to their families. Over the last past 11 years, they have been hit hard by the ravages of war. We have lost so many young men and women, proud and great Americans who gave their lives in Iraq and Afghanistan, who gave their lives to a cause greater than themselves. At the same time, we have lost far too many here at home to suicide, and alcohol and drug abuse, and accidents resulting from high risk behavior. And we are losing others in different ways, to PTSD and traumatic brain injury, injuries we can see, and many we cannot. Supporting them, supporting their families -- those loved ones who've faced the stress and strain of long separations caused by repeated deployments and now are picking up the pieces as their loved ones return home -- that, too, is our fundamental obligation. Continuing to fund vital family and support programs isn't just important, it's a moral imperative. Some of the challenges we face, and some of the problems plaguing our Soldiers are caused neither by injuries nor declining budgets. They result from a breakdown in good order and discipline, in values and judgment and respect. And nowhere is that more apparent than in our fight against sexual harassment and sexual assault. This Army is an organization, above all else, built on and bound by values; an organization that professes allegiance to loyalty, duty, respect, selfless service, honor, integrity and personal courage. Sexual abuse and sexual assault in all forms are abhorrent to each and every one of those values; and if we are to live by and uphold those honored standards, it is our duty -- our solemn responsibility -- to act, to do more, each and every day. To do otherwise, as Secretary Hagel has described it, is "a profound betrayal of sacred oaths and sacred trusts." We should all full recognize that every day, around the world, the overwhelming majority of Soldiers and civilians more than honorably, more than capably meet the standards embodied in our Army Values. But offenses, even by a few, hurt and destroy the victims, dangerously erode our institutions, and they crush the bedrock of trust that has been the hallmark of this Army's success. Simply put, sexual assault in all forms is a crime, and it cannot, it will not, be tolerated at any level, at any time [applause]. We have a solemn obligation to do everything possible, everything necessary to safeguard those who step forward to serve because they are America's sons and daughters. This Army's leaders, at every level of command, will pursue this standard through prevention, education, investigation and, where appropriate, prosecution. And if our leaders fail to lead, they will be replaced. To fortify and maintain our bedrock of trust, we also have to ensure accountability and responsibility in all things, and at all levels. In today's environment, incidents on the battlefield or in garrison can have strategic implications for the Army, for the Department of Defense, indeed, for the Nation as a whole. Winston Churchill is widely credited with observing that "a lie can gallop halfway round the world before the truth can pull its trousers up." A photo or YouTube video travels even faster than that. And even if it may not be a lie, appalling conduct or bad behavior provides our enemies with yet another weapon to be used against our Nation and our Soldiers. Accountability should begin with personal responsibility, and upholding all that the uniform of the American Soldier represents. True accountability doesn't begin and end with the individual; it has to be part of our structure, part of our processes. Whether purging the ranks of toxic leaders, or taking responsibility for fixing our institutional failures where we find them, holding ourselves and holding those we supervise accountable should not begin with an investigation, rather, it should exist as an enduring principle, reflecting our shared values -- the things that have guided this Army for some 238 years. We can do better. We must do better. We will do better. How do I know? I've seen it in their eyes. I've seen it in the faces of the men and women who serve, the Soldiers who not only share, but project those values each and every day. Since I last spoke with you, three American Soldiers have been awarded the Medal of Honor: Staff Sergeant Clint Romesha, Staff Sergeant Ty Carter and, just last week, Captain Will Swenson. Romesha and Carter were honored for their heroics in the Battle of Kamdesh, or as many of us know it, COP Keating. Capt. Swenson is the second Medal of Honor recipient to emerge from the Battle of Ganjgal. That two engagements should produce four Medal of Honor recipients says much not only about the ferocity of those battles, but the valor, courage and sacrifice of those who fought them. They, truly, are an inspiration to us all [applause]. This summer, we marked, as you heard during the incredible presentation before the speeches, the 60th Anniversary of the Korean War Armistice. And if you ever wanted to see what the service of the American Soldier has meant to the world, you saw it easily at that time in two starkly different events. In one, at a ceremony on the Mall here in our Nation's capitol, President Obama spoke at the Korean War Memorial to a crowd of some 5,000 people, many of whom were, indeed, veterans of that long-ago conflict. And he spoke of their resilience, their compassion and gallantry, and the hope that they gave to the world for a better, freer tomorrow. Around that same time, half a world away, the North Korean government marked the same occasion by putting on display the USS Pueblo, famously, taken by the communist government in the 1960s. That day, the oppressed people of North Korea were forced to look back, to cling to a long ago relic that serves, even today, as a poor substitute for the peace and prosperity enjoyed by their neighbors to the south. Back in the U.S., President Obama reminded our Korean War veterans that the Americans "see," as he put it, "clearly, and understand fully, the true legacy of your service." The President went on, "We can say with confidence that war was no tie. Korea was a victory. When 50 million South Koreans live in freedom -- a vibrant democracy, one of the world's most dynamic economies, in stark contrast to the repression and poverty of the North -- that's a victory," he said. That is their legacy [applause]. Through 238 years, the Army -- your Army -- has built an incredible legacy of freedom and peace, liberty and hope, both here at home and to the oppressed across the globe. "If you like what our country stands for and are willing to fight to protect those ideals, you ought to be a soldier. "If the sound of the national anthem and the sight of our flag stir something inside you, then you ought to be a soldier. "If you like a challenge, are not afraid of hard work, and think you are tough enough to meet the standards on the battlefield, then you ought to be a soldier. "If the thought of at the end of your life you can say -- or have someone say about you -- that you served your country, if that appeals to you and you need no other reward than that, then you ought to be a soldier." To all those everywhere, to our Soldiers fighting in Afghanistan, the men and women who, at this moment, serve in nearly 160 countries across the globe, to their family members and to our civilian workers, to all those who are stirred by the site of our flag flying freely, to all those who protect our ideals, ensure our freedom and preserve liberty for those elsewhere: Thank you, God bless you; God Bless the United States of America and this glorious Army who keeps her free.